Tipping equipment for bins, carts and totes. 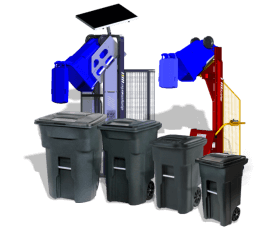 Simpro manufactures the world’s most comprehensive range of wheelie bin lifters, tote tippers, trash can dumpers and food-grade bin emptying equipment. The Ezi-MT® is an economical hand-winch bin lifter from Simpro, ideal for low-volume users such as schools, cafes, small businesses, and local councils. The brochure for the Ezi-MT hand-winch bin lifter from Simpro. The User Manual for the Ezi-MT hand-winch bin lifter from Simpro. Support articles, troubleshooting guides and spare parts for the Simpro Ezi-MT bin lifter. The online User Training questionaire for the Simpro Ezi-MT. Online spare parts list for the Simpro Ezi-MT. The video overview of the Ezi-MT hand-winch bin lifter from Simpro. 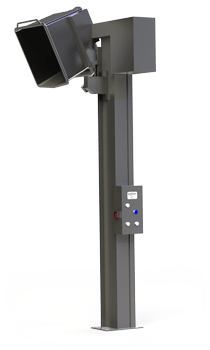 Multi-Tip® is a high-speed mobile bin lifter from Simpro, with a battery-operated mechanism, advanced safety features and 150kg lifting capacity. The brochure for the Multi-Tip electric bin lifter from Simpro. The User Manual for the Multi-Tip electric bin lifter from Simpro. Online product support for the Simpro Multi-Tip bin lifter. Online user training questionnaire for the Simpro Multi-Tip bin lifter. Online spare parts list for the Simpro Multi-Tip bin lifter. 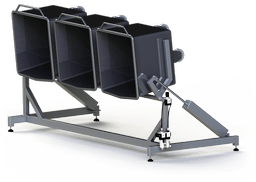 CAD Models for the Multi-Tip bin lifter from Simpro. 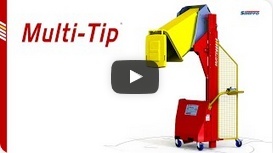 The video overview of the Multi-Tip high-speed mobile bin lifter from Simpro. The Simpro Dumpmaster® empties any bin at any height - quickly and safely - with an electro-hydraulic mechanism that can lift more than 250kg. The brochure for the Dumpmaster bin lifter from Simpro. The User Manual for the Dumpmaster bin lifter from Simpro. Online product support for the Dumpmaster bin lifter from Simpro. Online user training questionnaire for the Dumpmaster bin lifter from Simpro. Online spare parts list for the Simpro Dumpmaster bin lifter. CAD Models for the Dumpmaster bin lifter from Simpro. The Hazard and Risk Assessment for the Dumpmaster bin lifter from Simpro. 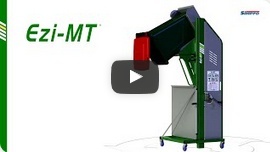 The video overview of the Dumpmaster heavy-duty mobile bin lifter from Simpro. MegaDumper® is a heavy-duty industrial bin lifter from Simpro, which effortlessly empties large MGBs, wheelie bins, carts and totes weighing up to 600kg. The brochure for the MegaDumper bin lifter from Simpro. The user manual for the MegaDumper bin lifter from Simpro. Online product support for the MegaDumper bin lifter from Simpro. Online user training questionnaire for the Simpro MegaDumper bin lifter. Online spare parts list for the MegaDumper bin lifter from Simpro. CAD Models for the MegaDumper bin lifter from Simpro. The Hazard and Risk Assessment for the MegaDumper bin lifter from Simpro. 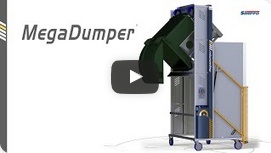 The video overview of the MegaDumper ultra-heavy-duty mobile bin lifter from Simpro. 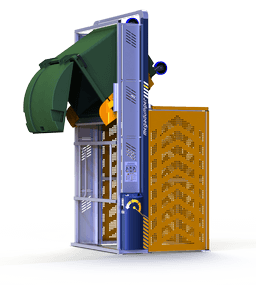 Hiflow is an industrial-grade bin lifter from Simpro, with high throughput capacity and an innovative mechanical comb hitch to suit 660L and 1100L bins. The user manual for the Hiflow bin lifter from Simpro. Online spare parts list for the Hiflow bin lifter from Simpro. Eurover is a stainless-steel single column bin lifter from Simpro, with a reliable worm drive and 300kg capacity, ideal for the food-processing industry. Online product support for the Simpro Eurover bin lifter. Online spare parts list for the Simpro Eurover bin lifter. 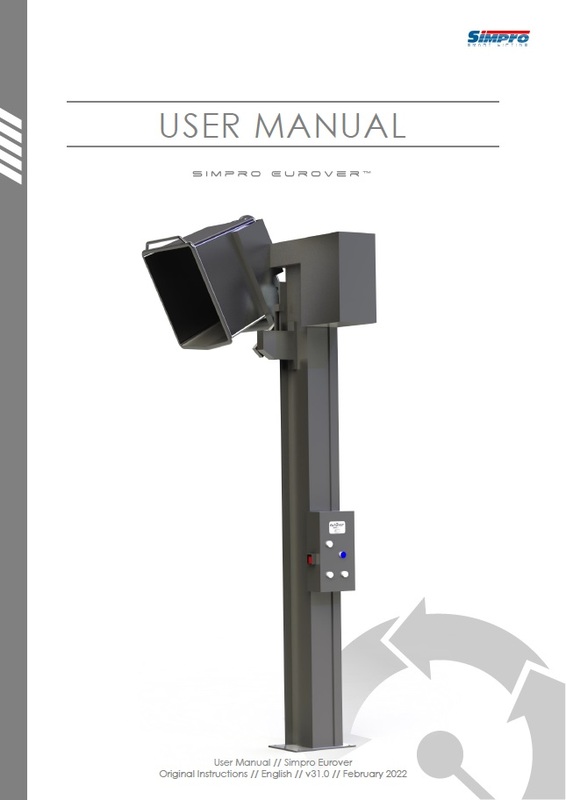 The User Manual for the Eurover ingredient bin column lifter from Simpro. Dumpmaster SS is a high-speed food grade bin lifter from Simpro, with polished stainless steel construction and a versatile modular design. Online user training questionnaire for the Dumpmaster SS from Simpro. Online spare parts list for the Simpro Dumpmaster SS. The User Manual for the Dumpmaster SS food-grade bin lifter from Simpro. 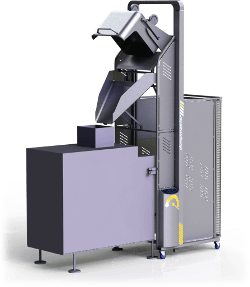 MegaDumper® SS is a heavy-duty food-grade bin lifter from Simpro, designed to empty very large bulk produce bins at almost any height, quickly and safely. Online user training questionnaire for the Simpro MegaDumper SS. Online spare parts list for the Simpro MegaDumper SS. 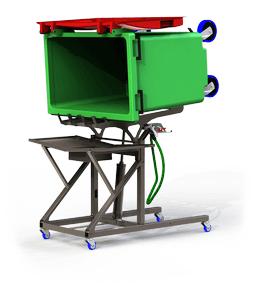 The Simpro BinBlaster draws hydraulic power from the water supply to make cleaning wheelie bins a breeze. Without electricity. 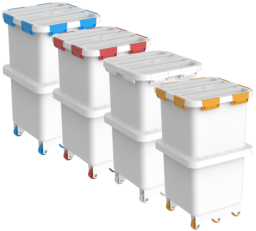 Euroblaster is a pneumatic food-grade bin wash frame from Simpro, which inverts common ingredient bins at an ergonomic height for easy cleaning. 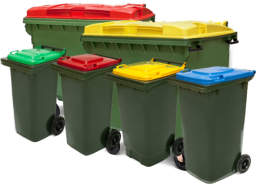 Simpro supplies a range of specialist bins and handling equipment for use in the waste management and recycling industries. 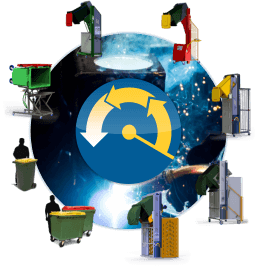 The complete catalogue of Simpro materials handling equipment for waste management and recycling. 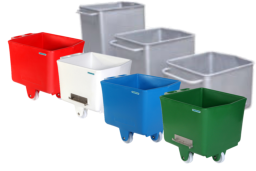 Simpro supplies a range of specialist bins and handling equipment for use in hygiene-critical industries such as food processing. 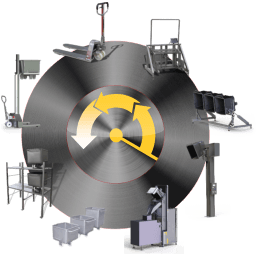 The complete catalogue of Simpro materials-handling equipment for food processing and other hygiene-critical industries. 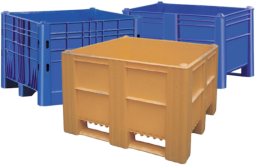 Simpro supplies a comprehensive suite of handling equipment to suit EN840 wheelie bins, including bins, lifters, tippers, washers and trolleys. Simpro supplies a range of handling equipment to suit USA-style (ANSI Z245.60 Type 2) trash carts, including bin lifters, tippers and wash frames. Simpro supplies a range of handling equipment to suit food-grade DIN9797 Eurobins, including stainless steel bin lifters, stackers, scales and wash frames. Simpro supplies a range of handling equipment to suit FoodCap® ingredient capsules, including stainless steel bin lifters, stackers, scales and wash frames. Simpro supplies a range of handling equipment to suit bulk produce bins - such as Nally, Mega, and Dolav bins - including heavy-duty bin lifters and pallet jacks.